You are here: Home / Dips, Spreads, and Dressings / Vegan Clam Dip – Unbelievable Mock Clam Dip! 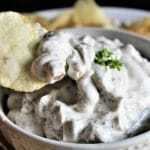 This vegan clam dip is amazing! 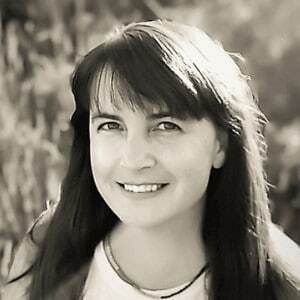 It has fooled many people into thinking that it is the real deal. However, it’s 100% plant-based and gluten-free! Made with king mushrooms for the clam texture and kelp granules to give it the authentic seafood taste. If you like clam dip, but no longer eat seafood, this is a must try!!! Clam dip was one of those things that we would have on special occasions like New Year’s Eve or at a Super Bowl party. I used to love the taste of seafood, and clam dip was my absolute favorite. A few years ago, I ate my first king mushroom. With the first bite, I knew that I could make amazing mock seafood recipes with them. I first made some Linguini with Clam Sauce, which came out delicious! Then I had the idea of making clam dip with these mushrooms. I was thrilled when it came out incredibly similar to the dip I remembered my mom making as a child! How do you prepare king mushrooms? To prepare these king mushrooms, simply wash them and cut off the bottom inch or 2 where it begins to get a harder texture and cut of the top brown cap as well. 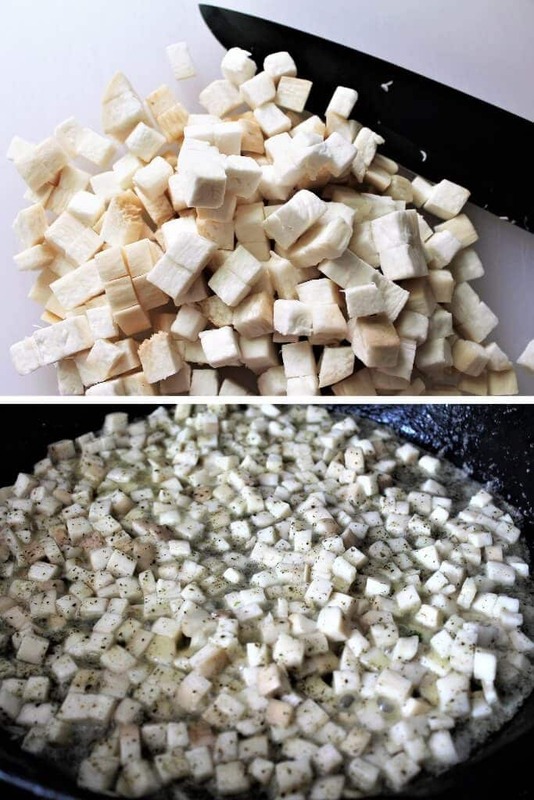 Then simply dice them into small cubes for this recipe. The cap has a strong mushroom flavor that you don’t want in this dish. The middle stem portion has a very mild flavor and soft seafood like texture. I cut the mushroom into small pieces about 1 cm. cubed. They will get a little smaller once they have cooked and be the same size and similar texture as pieces of diced clams. How do you make vegan clam dip? Add oil to the bottom of a skillet. Add diced mushrooms and sprinkle with salt and ½ tsp of kelp granules. Fry in oil on medium heat until they release their juices and become slightly translucent. While mushrooms are cooking, mix hot water, salt, garlic powder, and the other ½ tsp kelp granules in a bowl and let it sit for a few minutes. Add vegan cream cheese and cooked mushrooms to the bowl of the broth mixture and mix well. Chill for at least an hour to allow the flavors to mix. This recipe works great to make up a day ahead of a party! Note: I find these kelp granules at Whole Foods or my local Asian Market, but you can also order it from Amazon if you don’t live near one of these stores. If you don’t eat meat, but love that seafood taste, you won’t regret getting some of this stuff! I also use it to make my vegan “tuna” salad and my linguini with clam sauce which are both amazing)! Where do you find king mushrooms? I get mine at a local Asian market. They seem to consistently have them at most Asian grocery stores. If you can’t find them near you and your feeling ambitious, you can order the spores through Amazon and grow your own. Do you miss seafood dishes? Try this Linguini with Clam Sauce! You’ll also love this vegan mock “Tuna” salad! You can make an authentic tasting tuna sandwich or a vegan tuna melt! Don’t forget to pin the vegan clam dip recipe for later! 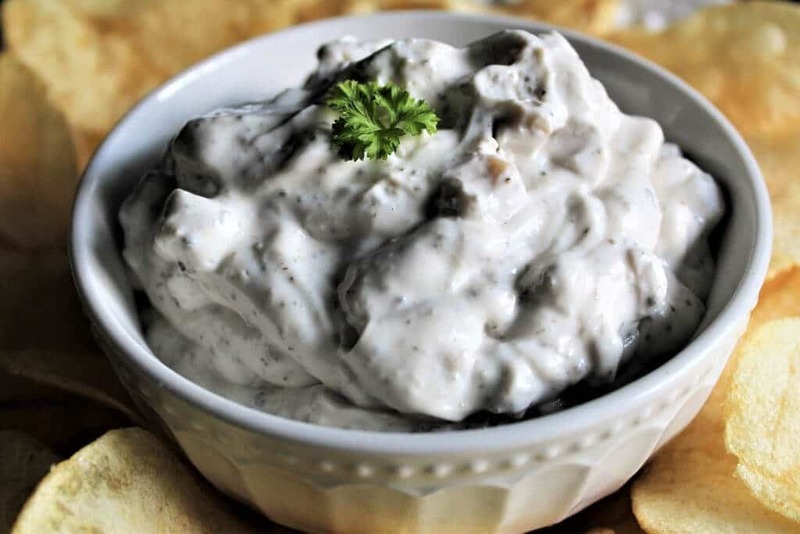 A mock clam dip using king mushrooms to make vegan clam dip. 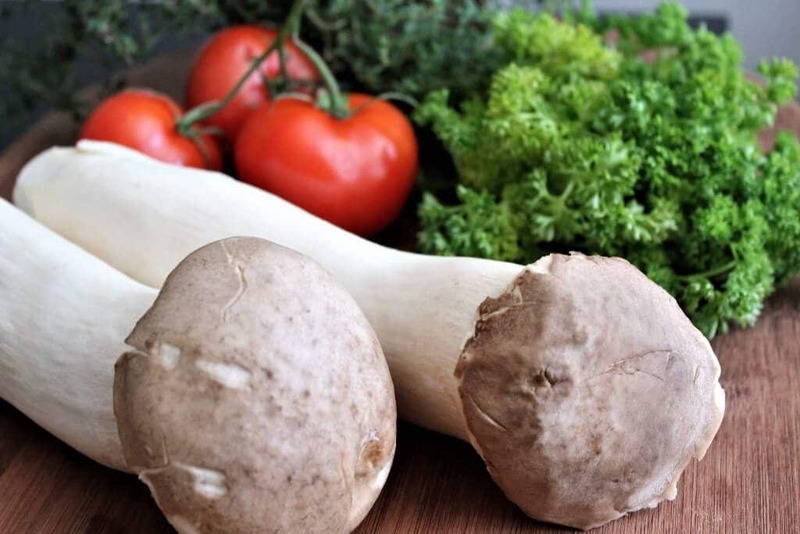 Wash the king mushroom and cut off the bottom 1 ½ inches and the brown cap off and discard. Dice the mushroom into small bite sized pieces about 1 cm cubed. Add mushrooms and sprinkle with salt and ½ tsp of kelp granules. Add vegan cream cheese and cooked mushrooms to the bowl of broth mixture and mix well. 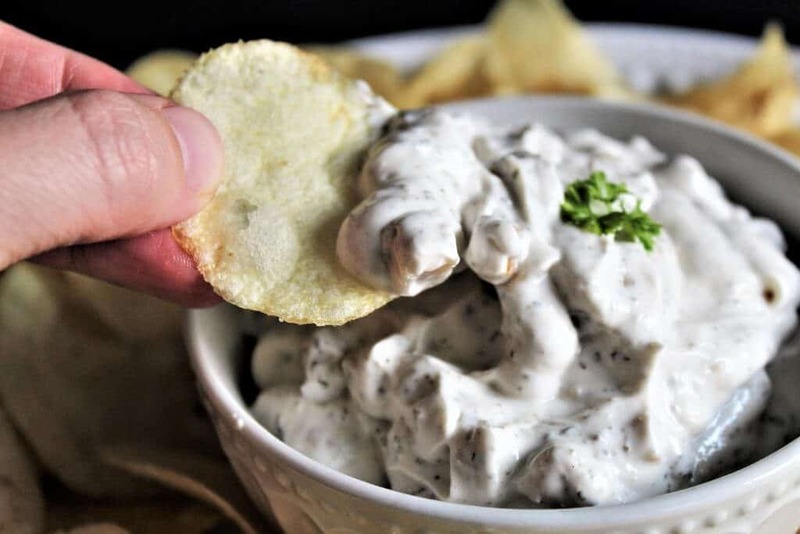 You can eat this dip immediately, however, the flavors mix better if it is allowed to sit in the fridge for at least an hour. Perfect to make a day ahead and have it ready for a party. This stuff is seriously crazy! It really tastes like clam dip! Thanks so much for this recipe! I’ve missed that taste of seafood!